Superior even temperature - Unlike heavy cast pans, electric aluminium skillets or toasted ovens that are designed to cook food, The reflowR is designed specifically to heat PCB's, it uses a special large flat heater element and thick aluminum plate right between the heater and the top plate to spread the heat evenly across the entire PCB without uneven cold spots like a toaster oven and controller example. 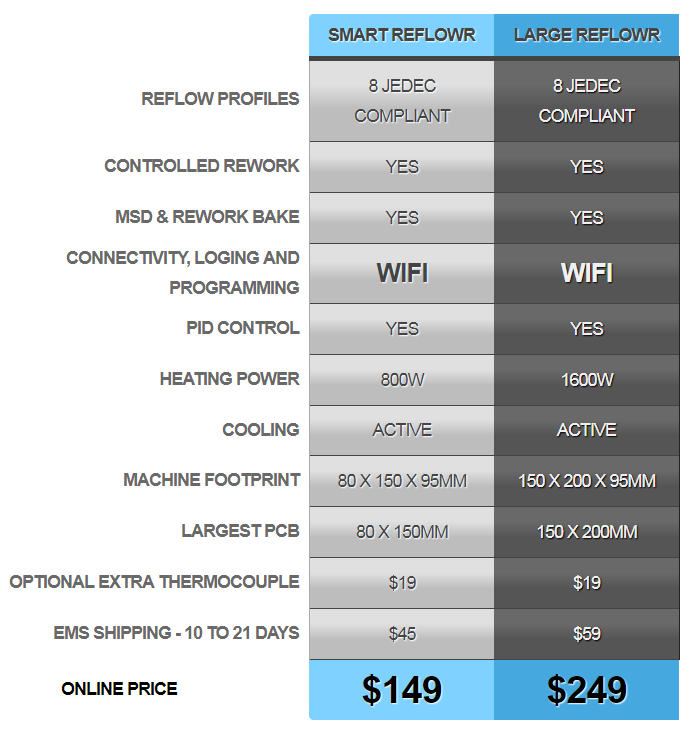 Multifunction - Reflow , Rework, MSD bake or Rework pre-bake. A total of 8 profiles are available from the start button, and with the WiFi infinte profiles are available from your phone or PC. Proper PID temperature control - JEDEC reflow profiles compliant. Small heat capacity and thermal mass, with active cooling and microprocessor control delivers fast, accurate temperature rise and fall. Superior rework function - Reworking large parts like Quad Flat Packs (QFP) can be problematic when having to apply heat with a hot air pencil or trying to hold a board on a skillet while trying to prod the part with tweezers or a soldering iron, all the while rushing and panicking that you are over heating the part or damaging the board. With a reflowR the board will be held in place, and brought up to just the right temperature so that you can place and exactly re-align the the part without stress on the part or your nerves. Web app and open web service - In addition to the phone app, reflowR will have a web app so it can be controlled from any browser. It will also have a JSON based web service so you can write your own app and control the reflowR directly if you like. Auxiliary Thermocouple input - provides an external second thermocouple input to monitor temperature either at the top of the PCB or on large components such as connectors. Buy from either Tindie,Indiegog or directly from me. Created by Lafras Henning, based on Bootstrap.